TROY, NY - The Tri-City ValleyCats, a Class A affiliate of the Houston Astros, have announced the rest of their 2019 summer promotions, highlighted by Summer of Love Night on Wednesday, August 14 in celebration of Woodstock's 50th anniversary. The ValleyCats will be giving away bobbleheads of Rock N' Roll Hall of Famer Jimi Hendrix, and the team will be wearing tie-dye themed jerseys which will be auctioned off to benefit the National MS Society, Upstate New York Chapter. The first 1,500 fans through the gates on August 14 will receive the commemorative bobblehead of Hendrix, who headlined the Woodstock Music & Art Fair on August 18, 1969 in Bethel, NY, just 120 miles away from the ValleyCats home in Troy. Season ticket holders and classic mini plan holders are guaranteed the bobble. Continuing with the anniversary theme, the ValleyCats will host Field of Dreams Night on July 11th to commemorate the 30th anniversary of the classic baseball film. On Wednesday, July 10 the ValleyCats will host Women in Sport Night, shining the spotlight on women in all of sports, and their accomplishments. Other new additions to the 2019 promotional calendar include Circle of Life Night on June 22, The Office Night on August 6, and Arts in the Park on August 27. Fan favorite returnees include Dollar Dog Night presented by Sabrett on June 30 featuring one dollar hot dogs, Beach Night on July 8, Veterans Night presented by CSEA on July 18, Christmas in July on July 31, Irish Night presented by Hudson River Community Credit Union on August 7, MiLB CommUNITY Night on August 16, Hockey Night on August 22, and Around the World in Nine Innings presented by Alaant Workforce Solutions on August 23. The 2019 season concludes during Staycation Weekend at "The Joe" beginning on Saturday, August 31st presented by Driscoll Foods. Enjoy Troy Night will take place on Sunday, September 1st with a 5:00pm start time, and the regular season comes to an end on Labor Day with an End of Summer Bash Monday, September 2nd with a first pitch of 3:00pm. There will be 15 fireworks shows throughout the 2019 season, including a super extravagant display presented by Price Chopper/Market 32 on the 4th of July. 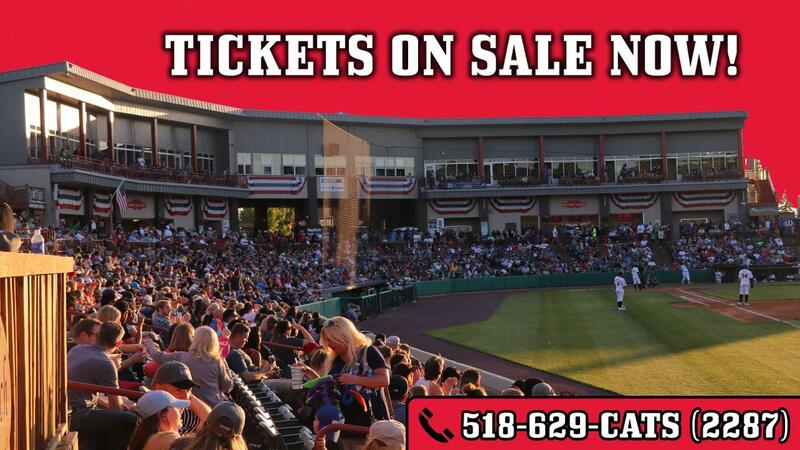 Individual tickets, season tickets, mini plans and flex vouchers for the ValleyCats' 2019 season are currently available for purchase online at tcvalleycats.com or by calling 518-629-CATS. The ValleyCats are also taking reservations for groups of 20 or more. All promotions and game times are subject to change.